In an attempt to expand my boundaries, I agreed that we should be primarily camping on the US leg of our trip. 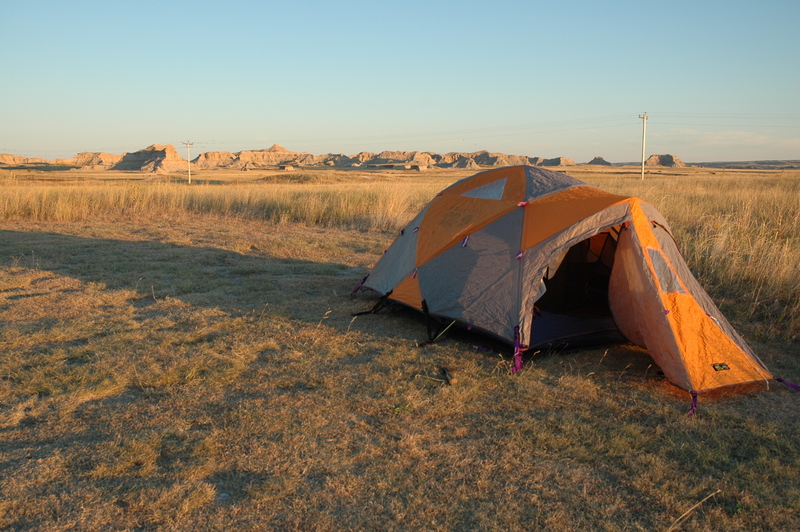 And where did we decide to begin this camping adventure but in the Badlands National Park in South Dakota — so inviting sounding, how could I resist! We drove around all three loops of the campground and finally settled on a place on top of a hill surrounded by creamy-white pinnacles. It was only a little before 7pm but the sun was setting and everything was painted a light orange. We pitched away and by the time the sun set and the sky was full of stars, I was enchanted. By 8pm it was pitch black, save the millions of stars, and I was in the tent drifting off to sleep with the sound of coyotes howling in the background. I don’t know if those of you that have fallen asleep to the sound of coyotes would agree, but I found the sound strangely soothing. Perhaps that is due to my overly inflated faith that our little tent can protect us from anything, and the fact that the coyotes sounded like they were a mile away. Next camping stop – the Black Hills. Not quite sure if I’ll have that same soothing feeling about mountain lion growls, even a mile away. I love your wanderful posts!